With grim statistics revealing the shocking truth that asbestos-related diseases kill more people than road accidents in the UK each year, there’s no doubt that something drastic needs to be done about the ‘silent killer.’ Perhaps the main difficulty is that while many other diseases, including work-related ones, are easy to recognise and diagnose, this is certainly not the case with asbestos. In fact the time between the first exposure to asbestos - from sources such as insulation and building materials - and people falling victim to the disease is rarely less than 25 years and often more than 50 years. As regulations surrounding asbestos were tightened in the early 1980s, many doctors now fear that the next few years could see a potential timebomb in the number of victims falling prey to asbestos-related diseases. Such is the concern about the effects of asbestos that government ministers have intervened to introduce policies to try and limit its dangers. Indeed, one recent storyline on UK television series Emmerdale saw a young character contract a disease, serving to raise the profile of the dangers associated with asbestos. Under the Control of Asbestos Regulations 2012 (Regulation 4) the onus to manage asbestos is placed upon owners and occupiers of commercial premises who have responsibility for maintenance and repair activities. They also have a duty to assess the presence and condition of any asbestos-containing materials. If asbestos is present, or presumed to be present, it must be managed appropriately. It is important to emphasise that the current regulation places a legal duty on employers to provide information, instruction and training to any employees likely to be exposed to asbestos as part of their work. The need to raise standards of training within the asbestos industry has been widely acknowledged and ultimately led to the formation of the United Kingdom Asbestos Training Association (UKATA) in 2008. Its remit was to set standards, audit and manage the list of asbestos training providers going forward. Despite the wealth of legislation designed to tighten up company policies and procedures surrounding asbestos, my colleagues and I continue to be appalled at the number of companies flouting the law – often with severe financial penalties. We must continue to get the message out there that asbestos is dangerous and that there’s no excuse for failing to ensure employees have the proper training when coming into contact with it. Cases are constantly being reported in which developers are using non-licensed and untrained contractors to deal with a highly dangerous material like asbestos. Yet this is completely avoidable, as there are many dedicated and highly skilled contractors in this country who are experts at removing asbestos safely. It’s deeply disturbing to continue hearing reports in this day and age that there are still companies who choose to put people’s lives at risk by not taking advantage of the expertise so readily available. Despite severe warnings, the threat of hefty fines and even jail terms, companies continue to ignore the severe consequences of exposing their employees and the public to asbestos. Unsafe handling of asbestos, when you aren’t trained to do so, puts lives at risk. A number of high-profile cases of companies breaching control of asbestos laws have recently hit the headlines. Earlier this year Shropshire company director Robert Marsh was sentenced to a year in jail after being found guilty of various offences, one of which was to knowingly use second-hand roofing panels containing asbestos. The offence came to light after one of his employees fell to his death through one of the panels. It was a shocking and sad case that saw a man lose his life. The sad truth is that we’ve lost count of the number of similar stories, and custodial sentences such as the one received by Mr Marsh seem the only way to making people think twice about taking dangerous and life-threatening shortcuts for financial gain. The lengths Mr Marsh went to in order to hide any wrongdoing exposed him as an irresponsible criminal with no regard for client and employee health and safety. This case further emphasises the need for more awareness when it comes to the dangers and legal implications of asbestos, and demonstrates the paramount importance of consulting a trained asbestos professional when carrying out any building work. In another case, Battersea-based Redwood Contractors Ltd was ordered to pay fines of £10,000 and £2,857 after pleading guilty to two separate breaches of the Control of Asbestos Regulations 2006. The building company failed to highlight that asbestos insulating board (AIB) was present in a warehouse in Berkshire and allowed their workers to remove the asbestos without the correct protective equipment and adequate control measures. This was despite being in possession of a detailed asbestos survey that identified the location of the asbestos wall panels in the warehouse. 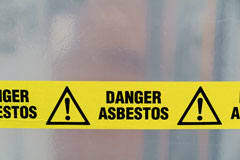 Also, Bristol developer Da Vinci Property Development Ltd was fined £10,000 for failing to protect staff after it emerged that three of the company’s employees were exposed to deadly asbestos dust. So what exactly is asbestos and how does it affect the respiratory system? Crocidolite asbestos belongs to the amphibole family of asbestos types. As such, it’s quite finely textured and looks very much like human hair. Its colour ranges from a dull slate grey to a very vibrant dark blue. The fibres of Crocidolite are fairly flexible and able to bend to about 90 degrees before breaking. Crocidolite occurs in naturally-formed bundles that are long, sharp and straight. This makes it especially easy to inhale and also makes it the most hazardous of all types of asbestos. Considered to be the second-most hazardous type of asbestos, Amosite is also a member of the amphibole group of asbestos types - characterised by long, thin fibres that are brittle and break off easily, therefore prompting inhalation. Records show that approximately five percent of all asbestos used in commercial buildings or factories was, at one time, of the Amosite variety. It was used mostly in the manufacture of thermal insulation products and was also used in the production of acoustic and anti-condensation material. Chrysotile is the most widely used type of asbestos and is most abundant throughout the world. It is a form of serpentine asbestos, which means it has curly fibres that are not as easy to inhale as the needle-like fibres of amphibole asbestos. Chrysotile asbestos was used for a variety of consumer products because it was more flexible than the other types and could be spun and woven into various textiles including insulation, protective clothing, rope, and a variety of other products. It was also used in brake linings, floor and ceiling tiles, joint compounds, and many items used inside the home including toasters and hair dryers. When undisturbed, asbestos is harmless. When it is moved during building works, however, harmful spores are released into the atmosphere. When inhaled these spores can have potentially fatal effects later in life when they bring about the onset of diseases. The main four diseases associated with asbestos are mesothelioma, asbestos-related lung cancer, asbestosis and non-malignant pleural disease. Mesothelioma is a rare form of cancer that develops from cells of the mesothelium, the protective lining that covers many of the internal organs of the body. Most people who develop mesothelioma have worked in jobs where they inhaled or ingested asbestos fibres, or were exposed to airborne asbestos dust and fibres in other ways. Statistically men are much more likely to develop the disease, having a one in 150 chance compared to one in 773 for women (Cancer Research UK). Washing clothes of a family member who worked with asbestos also creates a risk for developing mesothelioma. Except lung cancer, there seems to be no association between mesothelioma and tobacco smoking, but smoking greatly increases the risk of other asbestos-induced cancers. Signs and symptoms of mesothelioma include shortness of breath due to pleural effusion (fluid between the lung and the chest wall), chest wall pain and constitutional signs such as unexplained weight loss. The diagnosis may be suspected based on chest X-ray and CT scan findings, but must be confirmed either by examining serous effusion cytology or with a biopsy (removing a sample of the suspicious tissue). Despite treatment with chemotherapy, radiation therapy or sometimes surgery, mesothelioma carries a poor prognosis. Research by Cancer Research UK indicates that due to the long latency period of the disease (average of 40 years) the number of cases of mesothelioma will most likely peak in the 2020s and decline thereafter in line with a peak in exposure to the substance in decades gone by. Research about screening tests for the early detection of mesothelioma is ongoing. Asbestos exposure is a risk for all types of lung cancer. This risk is increased further if you also smoke. Records suggest that there are in the region of 2,000 deaths each year in the UK caused by asbestos-related lung cancer. Asbestosis is a chronic lung disease characterised by a scarring of lung tissues, which leads to long term breathing complications. The disease doesn’t have a cure. It is caused exclusively by exposure to asbestos, but may not be diagnosed until decades after the exposure has occurred. Asbestosis is linked to the straight, thin amphibole fibres that are found in the different types of asbestos. Symptoms include laboured breathing, chest pain and coughing during routine tasks and exercise. Doctors prescribe breathing treatments, prescription medication and sometimes surgery for people with asbestosis. The prognosis is often positive. Because asbestosis is not a form of lung cancer or mesothelioma, people can live many years, even decades, with the disease. Because the condition gets worse over time, however, patients require increasing levels of treatment as they age. Non-malignant pleural disease is a non-cancerous condition affecting the pleura, which is the outer lining of the lung. It includes two disabling forms of disease: diffuse pleural thickening and the less serious pleural plaques. A substantial number of cases continue to occur each year in Great Britain, mainly due to workplace asbestos exposures many years ago. So just how does asbestos attack the respiratory system and cause the diseases highlighted above? Asbestos fibres are very tiny and sharp, and when inhaled they collect in the lungs. As the immune system starts trying to get rid of them, the lungs become inflamed. Because the immune system can’t get rid of fibres, connective tissue is deposited in the lungs. This scar tissue in the lungs prevents them from expanding and contracting properly, lowering their capacity. Breathing becomes difficult because of this constriction. As the lungs lose their ability to exchange oxygen and carbon dioxide properly, so too does breathing become less and less effective. When the lungs can’t deliver enough oxygen into the bloodstream, the heart works harder in an attempt to compensate. This can eventually put too much strain on the heart, causing heart failure. Symptoms may not appear until 10 to 50 years after asbestos exposure, by which time there is usually extensive lung damage. Symptoms include: shortness of breath brought on by physical activity; difficulty breathing, even at rest; coughing; hoarseness; chest pain; coughing up blood; frequent respiratory illness; difficulty sleeping; swelling of the hands, feet and ankles; and finger clubbing. With the risk of serious diseases and the threat of legal action hanging over them, employers must wonder what protection can be given to their workers against asbestos. Very often it’s simply a case of common sense and adhering to strict policies and guidelines. Adhering to a number of simple steps and precautions at the very start of a project involving asbestos removal can prevent many difficulties later on. Perhaps the most important thing to start off with is to carry out an extremely thorough risk assessment, which will invariably involve an asbestos survey. This will help you identify whether or not asbestos is present and help determine its type and condition. You can then assess if the work needs to be carried out by a licensed contractor. If so, you must ensure that contractors undertaking the work are suitably trained. Alongside the risk assessment you must draw up a list of emergency procedures and cascade these down through the whole workforce. These procedures must be factored into your work plans and practised continuously to ensure that everyone remains fully aware of them. It’s particularly important to ensure that any new members of staff are adequately appraised of these procedures. Having determined how and by who and the work is to be carried out, the next important consideration is which protective equipment to use and what training will be required. It’s essential that the correct training is provided, that all PPE is kept in good working order and that manufacturers’ instructions are followed at all times. It’s good working practice to carry out regular checks on protective equipment. Obviously, you need to ensure that all protective equipment is completely fit for purpose. Disposable overalls, for example, should be used as opposed to cotton overalls that hold dust; waterproof overalls should be considered for outdoor work. In addition, when you’re using protective clothing there are several other factors you should consider to help protect your workforce. At the end of the day a lot of advice is basic common sense, but we’re continually staggered by just how many organisations regularly flout the law and fail to put into place even the simplest of safety procedures. These procedures go a long way in reducing the serious dangers that asbestos poses in the workplace. While the dangers of asbestos are abundantly clear and there are a number of very effective processes that can be easily implemented, only time will tell if organisations will take the advice on board, adhere to legislation and reduce the risks in a bid to curb the ever-growing toll of asbestos-related diseases and, indeed, deaths.